I have a few of my favorite Red Carpet Manicure colors to show you today. I'm a sucker for glittery finishes, and these are just perfect if you ask me! The first polish I have to show you is Perfect High Heels. This is a beautiful royal blue jelly with blue glitter. When the light reflects off the glitter at certain angles, it takes on a purple hue. Next in line is my personal favorite red. 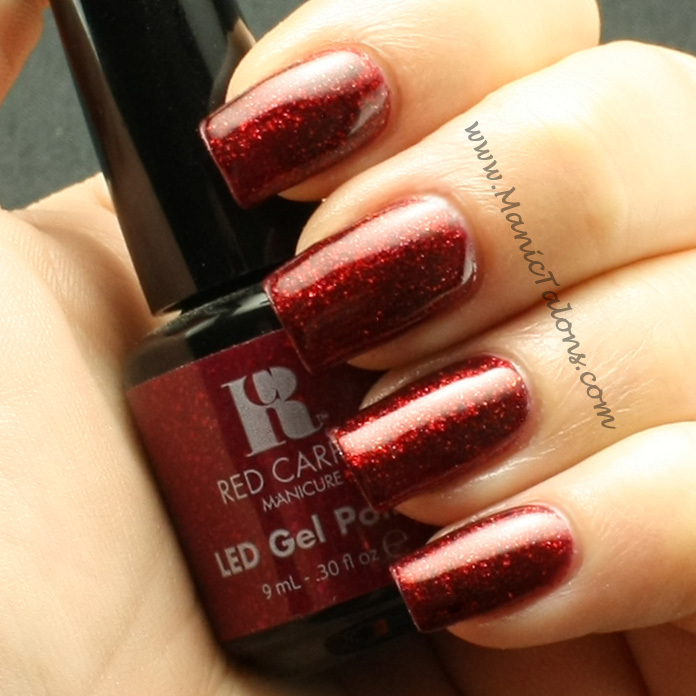 Draped in Rubies was originally released as a limited edition, but it was so popular RCM brought it back as a permanent part of their line. This is one of the few colors that I have worn multiple times with no nail art. I love it that much! My second favorite is An Evening To Remember. 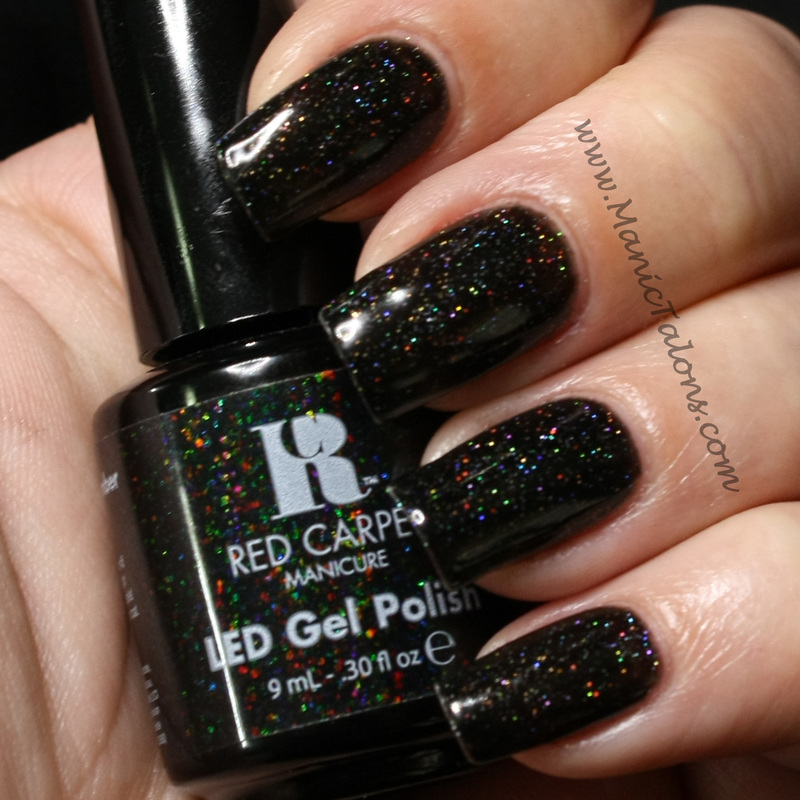 This black, scattered holo beauty was also a limited edition that RCM brought back as a permanent edition. I actually resisted this one for a while. I assumed I could recreate it with a black base and a holo glitter top coat like Gelish Vegas Nights. I was wrong. You simply can't recreate this with the same depth. The light box killed the shimmer in this one, so I snapped a picture under my ottlite. The above picture is color accurate for the base. 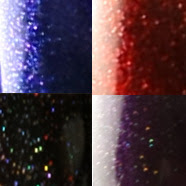 The following fully captures the holo shimmer. Finally, Scandalous is another gorgeous polish with holo shimmer. The shimmer in this one is not as dense as in Evening to Remember. It is just a hint that adds a bit of mystery to a deep purple base. I didn't think to grab a shot of this one under the ottlite, but I think you can get a good idea from this shot. After seeing these last two side by side, I decided they really were made to go together. So I did a little nail art that is half An Evening to Remember and half Scandalous with a little bit of Orly Shine to tie it all together. That's it for today. Which of these glitters would you be most likely to wear? Also, there's still time to enter the Nails for a Cause giveaway! The raffle ends tonight at midnight, November 20, 2013. So get those entries in while you still can!